A certain friend of mine who shall remain nameless (IT’S ME!!! )cites this as one of her favourite books of all time. As such, she has been trying to get me to read it for quite a few years now. On a recent visit to her, I happened to be in a bookshop and found a very reasonable second hand copy so on her advice I bought it. I’m sorry to say that the only thing I really knew about this novel before reading it, was that it was a love story about Elizabeth Bennet and Mr Darcy. I also knew that Mr Darcy was the type of man to make women swoon in his presence and by women I mean female readers, not just the characters in the book. Unfortunately for me and also for my friend, who will probably kill me for writing this, Mr Darcy did not have that effect on me. Not even close in fact. Let me start at the beginning…. 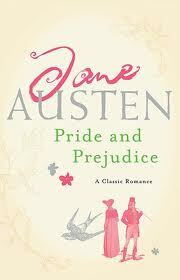 Elizabeth Bennet is one of the main characters in the book, she is the second eldest of a family of 5 daughters. Mrs Bennet is primarily concerned with making decent matches for her daughters and will do anything to put them in the sights of eligible gentlemen. Elizabeths older sister Jane soon catches the eye of Mr Bingley the latest batchelor to move into the area, and Mrs Bennet has high hopes for the couple. Now enter Mr Darcy, who is a close friend of Mr Bingley, but in contrast to Mr Bingley’s friendly, and enthusiastic air, Mr Darcy is quite shy and reserved, which comes across to the Bennets as condescending and a little bit snobby. So where is the grand romance?…I’m not too sure either, you see Darcy appears to take a dislike to the Bennets because of their status, and Elizabeth takes an immediate dislike to Darcy as she overhears him saying that there are no attractive women in the room for him to make the effort to dance with (bearing in mind he had just caught her eye moments before…ouch!). Things become yet more complicated when Elizabeth becomes a confidant for an old friend of Darcy’s and hears a story of his past that paints a very ugly picture. You would think this should be the end of their aquaintance, but that would make a very short and uncomplicated story now wouldn’t it? No, instead things get more complicated and life keeps throwing them together. My main problem with the book is the characters, I just couldn’t relate to them at all. From the annoying sister Lydia, who is supposed to be annoying to Elizabeth and Darcy themselves I just couldn’t bring myself to like any of them. Elizabeth is too quick to judge, for a character who is supposed to be strong willed, she believes whatever she is told about people without giving a second thought, and has no problems in spreading these lies to other people. Darcy is stubborn and condescending, he also judges people very quickly but in this case he bases his judgements on outward appearances, he wants nothing to do with the Bennets because of their status and also because of the way he see’s Lydia behave at a party and again delights in discouraging his friends from any association with them too. For me to like a novel, I must have some sort of relationship with the characters in it, I must either love them, pity them, or despise them, but with this, my dislike of the characters only went so far as to ensure I didn’t really care about them or the events in their lives. I have a feeling I could get lynched for this review however the novel just didn’t appeal to me one little bit. Won’t be picking it up again I’m afraid, although saying that, I did watch the film with Keira Knightly and also the BBC adaptation which weren’t bad so maybe I’d recommend a night in with some popcorn instead of picking up the book.